I think I mentioned before that in Junior High I got a taste of purple makeup and I liked it. 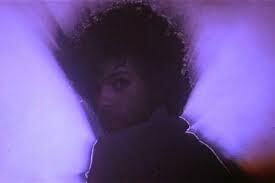 Maybe I liked it too much, BUT in my defense Prince and the movie “Purple Rain” were HUGE, everyone was doing it. Honest. As a an adult I have pretty much steered clear of purple, but in a fit of nostalgia I went crazy this summer and bought myself some purple eyeshadow and mascara. This quad of cream eyeshadows are cheap and easy, just the way I like em’. The colors include a lighter purple, a darker purple, a pink and a dark brown. I use my fingers to put these shadows on but you could also use a brush with no problems. The dark brown works great as an alternate to eyeliner. I think what I like best about these shadows is that they are so forgiving and wear so well. I’m wearing them all of them right now and I don’t even look like a clown. Prince would be jealous. 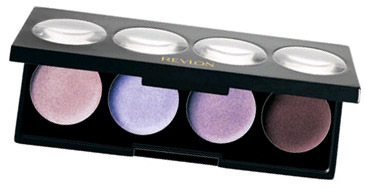 If this is too much purple for you, I urge you try out one of their more neutral quads because these eyeshadow are great. Everybody seems to love Maybelline’s Great Lash but me, I have never had any success with this Mascara. 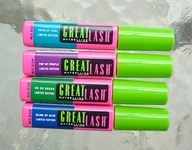 Recently Maybelline came out with a whole set of colored mascaras including teal, royal blue, green and purple. Since everybody deserves a second chance I picked this up in Pop of Purple. Uunfortunately I felt the same way about the purple version as I do the regular version. No matter how many coats I tried to put on I could not get the color to show up. Sadly, my purple dreams did not come true with this product. I had fun trying out these purple make up colors. It was fun jumping in the time machine. Also…. 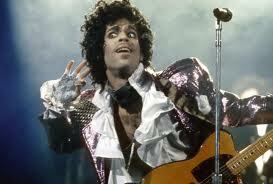 Raise your hand if you think Prince is the bomb! This post is dedicated to Jean “Wear something purple” Walton.